Daniel Howell and Phil Lester are two of the world’s biggest YouTube stars. From producing their own comedy videos, they have gone on to present a Radio Academy Award winning show for BBC Radio 1, host international coverage of the BRIT Awards, release an app game ‘The 7 Second Challenge’ which reached #1 on the iTunes store, and in 2017 the hit board game ‘Truth Bombs’. They also proudly support charitable organisations such as Young Minds, Stand Up To Cancer and the British Red Cross. In March 2015, Dan and Phil launched their debut book “The Amazing Book Is Not On Fire” and accompanying 75-date International tour “The Amazing Tour Is Not On Fire”. 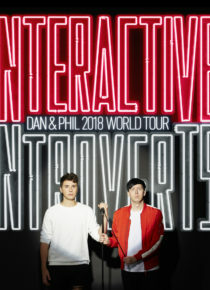 The book went to #1 on The Sunday Times and New York Times Bestseller lists and the tour became the biggest world tour ever undertaken by YouTube creators ..until now.